Don't have time to tune-in to Newsy? Get caught up on the day's top news with Newsy on Alexa! You'll still get Newsy's "facts with context" in a way that's accessible to you, wherever you are! To listen to Newsy, choose "Flash Briefing" within the Alexa app for Android, iOS or Fire devices and select Newsy as one of your preferred news sources. Then simply say, "Alexa, give me the news." 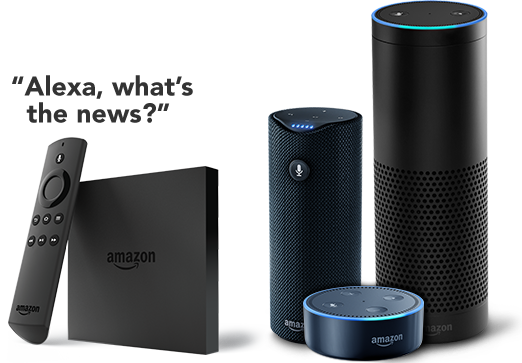 Your preferred Alexa-enabled device will deliver an audio feed of top news stories from Newsy. Tune in to Newsy on Alex now!